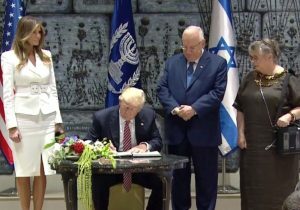 U.S. President Donald Trump began his first visit on Monday to Israel as the U.S. president. The stop is for two-days and will include talks about restarting the now-dormant peace process between Israel and the Palestinians. Trump was in Saudi Arabia for the weekend prior to landing in Israel. In Saudi Arabia, Trump was given a huge welcome by the royal family of the kingdom. The president was greeted warmly by Benjamin Netanyahu the Israeli Prime Minister on Monday. However, Trump may be questioned by officials in Israel about the revelations he disclosed sensitive intelligence about Israel with the Russians, as well as over concerns of the new arms deal worth $110 billion he announced with Saudi Arabia. Before Monday meetings with Netanyahu, Trump and Melania the first lady will visit the important Jewish holy site the Western Wall as well as what is believed to be the place where Jesus was crucified and where his tomb is located, the Church of the Holy Sepulcher. Trump on Tuesday will meet with Mahmoud Abbas the President of the Palestinian Authority. After Abbas’ visit in March to the White House, Trump stated boldly that achieving Middle East peace is not as difficult as many have thought during the years. However, Trump continued by saying there needs to be two parties who are willing to find peach and he believes Israel is and that the Palestinians are as well. Aides at the White House have attempted to play down the expectations for progress in peace negotiations during the current stop by Trump, making it seem more symbolic than it is substantive. While officials in Israel cheered the election of Trump, some are wary now of a tougher line the president took on settlements of urging restraint but not calling for a complete halt to their construction. Trump retreated as well from a pledge made during his presidential campaign of moving the Tel Aviv U.S. Embassy into Jerusalem bending to the same security and diplomatic concerns as other presidents that made promises of a similar nature. Palestinians, who looked at the victory by Trump with trepidation, are now pleasantly surprised at the openness of Trump during the recent meeting in Washington he had with Abbas. A senior officials who was part of the delegation, said that Trump planned to try to relaunch the peace talks, with the only goal being reaching a full-fledged agreement with the next year.